Whenever you compile a list with the title of "greatest x of all time" you're most certainly welcoming a lot of debate. Most reasonable football fans can roughly agree on irrefutable facts like Cristiano Ronaldo and Lionel Messi being the most dominant footballers on the planet for the past five years, but ask them to name who is the better player of the two and debates will rage. Open the debate up to having people name the top five players in the world right now and you're guaranteeing yourself a long night of arguing. So with much trepidation I've put together a list of the five greatest African footballers of all time. The one stipulation I set for myself is that I had to have seen the players in my lifetime. So in fairness to African greats of the past, I suppose this list could have been more fairly labelled 'The 5 Greatest African Players of the Past Twenty Five Years", but regardless of that the five players I've selected were definitely World Class footballers and would presumably make most people's top five or top ten lists. 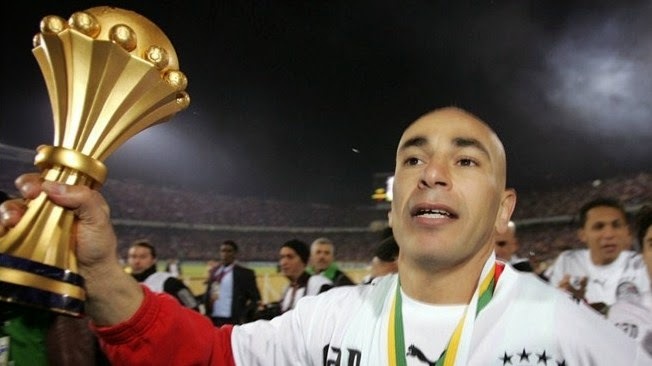 Although Hossam Hassan didn't make much of an impact away from North Africa, the Egyptian striker supreme is rightly lauded for his remarkable success with the Pharaohs, which whom he won African Cup of Nations titles in 1986, 1998, and 2006. Hassan scored 68 goals in 176 appearances for his country and led Egypt to a World Cup appearance in 1990 where they narrowly missed out on progressing out of the group stages. Hassan also enjoyed a successful career in Egyptian club football where he won thirteen league titles, five Egyptian Cups and one African Champions League with Cairo based giants Al-Ahly. He would later move to Al-Ahly's bitter rivals Zamalek, where he would win another three Egyptian league titles, an Egyptian Cup, and another African Champions League title. The three time African footballer of the year is widely regarded as Ghana's greatest ever player and one of the finest footballers to come out of Africa. Born with the name Abedi Ayew, after his football career began to take off he was given the moniker of the famous Brazilian and the name stuck. Abedi Pele was a skillful attacking midfielder who first came to prominence with Ghana after winning the 1982 African Cup of Nations. After beginning his club career in Ghana with Real Tamale United, Pele moved around between several clubs at home and abroad before finding success with the dominant Olympic Marseilles side of the late '80s and early '90s. With the French side he won three Ligue 1 titles and the 1993 UEFA Champions League crown. A key part of that all conquering side, the later controversy and scandal that plagued the club shouldn't diminish the accomplishments of this pioneering African footballer who found great success in Europe. 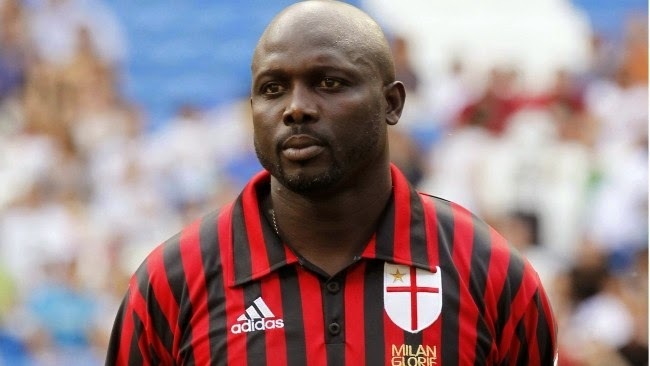 Although the great George Weah didn't enjoy much international success with the small footballing nation of Liberia, the explosive striker had a major impact on club football. After being brought to Europe by then Monaco manager Arsene Wenger, Weah flourished in Ligue 1, scoring 47 goals in 103 appearances for the club on his way to winning the 1989 African Footballer of the Year award, as well as helping the club to the 1991 French Cup. Subsequent moves to Paris Saint-Germain and AC Milan brought further success as he secured a Ligue 1 title and two Serie A titles respectively. He also won two more African Footballer of the Year awards in 1994 and 1995, and became the first African player to win the coveted Ballon d'Or in 1995. 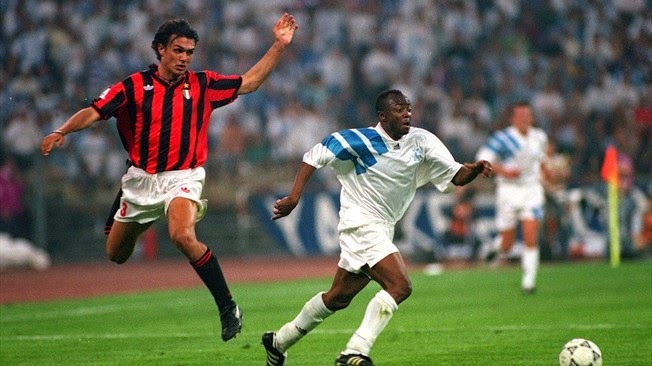 There's also the small matter of THIS famous goal he scored against Verona for AC Milan. The four time African Footballer of the Year could undoubtedly top this list, and perhaps many feel he should do, after a brilliant career for club and country. 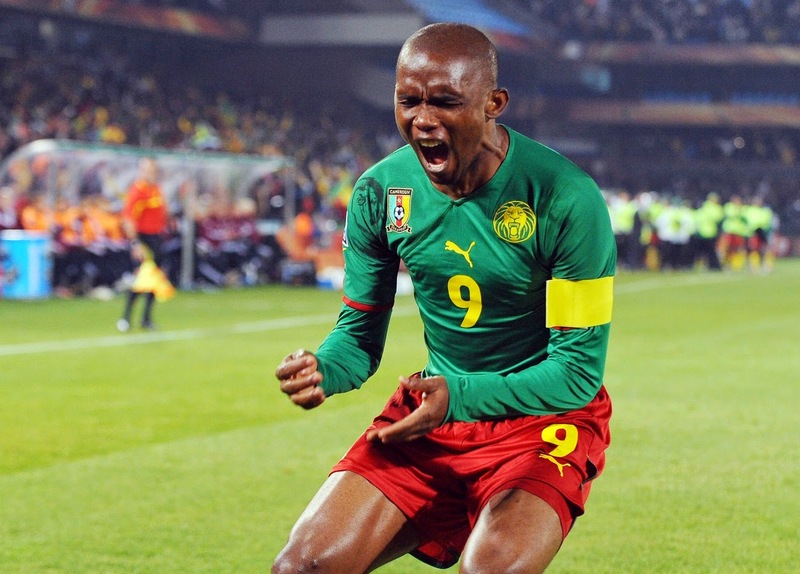 Samuel Eto'o helped his country, Cameroon to three World Cup appearances, one Olympic title and two African Cup of Nations wins. He was perhaps even more successful at club level though, with three league titles and two Champions League wins at Barcelona which he followed up with a Serie A title and another Champions League win for Inter Milan. Eto'o scored an incredible 108 goals in 145 appearances for the Catalan giants, before bagging 33 goals in 67 matches for Inter. The Cameroon international is still going strong for Everton in the English Premier League at the tail end of what has been a wonderful career. 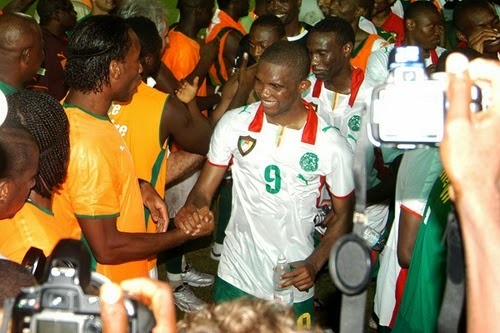 Ivory Coast's all time top scorer with 65 goals in 104 appearances, besides being his countries greatest player, Didier Drogba could also stake a claim at club level to be the greatest Chelsea player ever as well. Known for his physical strength, powerful presence in the air and his ability to bully defenders, Drogba is the prototypical 'lone striker'. 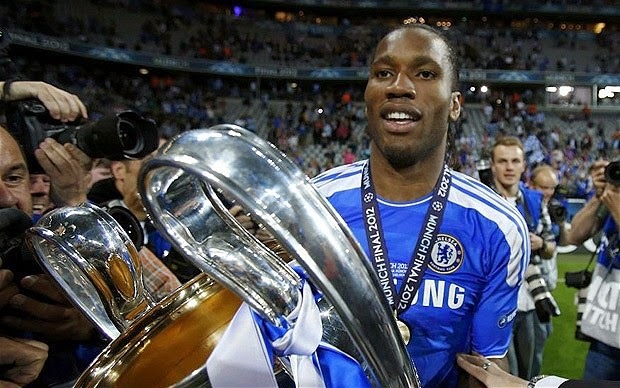 Scoring 101 goals in 233 appearances for Chelsea, who he initially joined after a successful season with Marseilles, none of his goals were more important than his late equalizer against Bayern Munich in the 2012 Champions League Final and his final successful penalty that handed the West London club their first win the top European competition. To go along with that win, he also played a key role in the club winning three Premier League titles, five FA Cups, and two League Cups. At international level, despite not winning any silverware with his country, he did lead his nation to two African Cup of Nations Finals that they subsequently lost on penalty kicks, and he also helped the Ivory Coast to qualification for the last three World Cup tournaments.